We frame both to display our artwork at its best and to protect and preserve it. One key element of this protection and preservation is making sure that the acrylic glazing (the glass-like sheet that covers your art) doesn’t lay directly on the artwork. If it does, most artwork, even photographs, will eventually stick to the acrylic due to lack of airflow. The airspace also helps prevent mold growth, paper buckling and image transfer to the acrylic. See how the spacer fits between the art and the acrylic. Simply run the spacers along the interior of the acrylic where they will sit on top of the art. The lip of the frame will keep the spacers from view. In many treatments, the mat does the job of creating airspace between the acrylic glazing and the art. But what if you’re framing without a mat or would rather float your art for a different visual effect? Easy: use an EconoSpace artwork spacer instead. 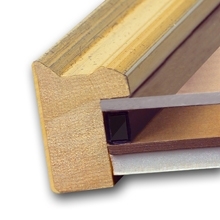 These square rods are specifically made to fit invisibly under the lip of any metal or wood frame, between the acrylic glazing and the art. Made of pH-neutral acrylic, the spacers bond to the treatment’s acrylic glazing via a super-simple peel and stick design. EconoSpace spacers can be used to frame any paper art or document, including photographs, watercolors and pastels. The spacers are available in 2 sizes. The 1/8 inch spacer comes in clear only. The ¼ inch spacer is available in clear and black. Black comes in particularly handy when floating art on a black mounting board. Both sizes can be ordered in lengths of 2’, 3’ and 5’ and are easily cut with scissors or a utility knife. Each bundle has 12 sticks per color, size and length. To see an EconoSpace spacer in action, check out our video featuring yours truly. If I can do it, really, anyone can!